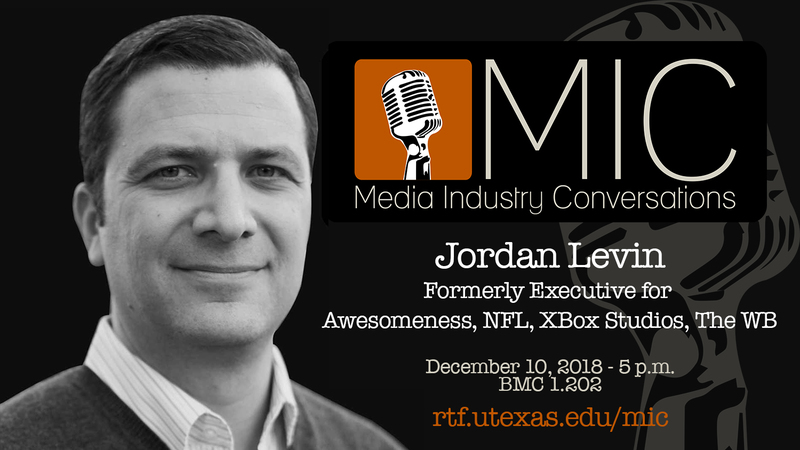 When: Monday, December 10, 2018 - 5-6:15 p.m.
Jordan Levin discussed his career trajectory since his time as an RTF major as well as his roles and responsibilities in his recent position as CEO of the multi-platform media company, Awesomeness. The conversation also addressed the evolving role of both legacy and new media companies in production and distribution, as well as how emerging platforms are impacting the larger media landscape. As former CEO of Awesomeness, a leading multi-platform media company defining the future of entertainment, Levin was responsible for growing Awesomeness and its suite of digital networks, AwesomenessTV, DreamWorksTV, and Awestruck, as well as its film and television studio arms. Along with parent companies Comcast NBCUniversal, Verizon, and the Hearst Corporation, Levin continues to build on Awesomeness’ success establishing an authentic brand to empower the next generation of creators and consumers. Before joining Awesomeness in 2017, Levin spent the past two years serving as the NFL’s first Chief Content Officer, overseeing the league’s content portfolio across its digital properties, social channels, NFL Network, NFL Films, event programming such as the Super Bowl Halftime Show and NFL Honors, and external partnerships. Prior to the NFL, Microsoft recruited Levin in early 2014 to join its nascent Xbox Entertainment Studios division as Executive Vice President, General Manager tasked with coordinating the launch of an interactive, video-on-demand programming service creating original premium content for the global, over-the-top Xbox platform. In 2005, Levin built Generate, a pioneering studio and talent management company that successfully developed and produced fiction and factual entertainment and customized branded content for a variety of distribution outlets and programming services across both traditional and digital platforms. Alloy Digital acquired Generate in 2011 to form a first-of-its-kind, multi-platform media company. Levin served as President of the new entity, combining Generate’s assets with Alloy Digital’s top-ranked channels and proprietary networks. Alloy Digital subsequently merged with Break Media in Fall 2013 to form Defy Media, a vertically-integrated enterprise consolidating content development, talent management, production, marketing, sales and distribution. In 1994, Levin joined The WB Television Network as part of its founding executive team where he spent a decade helping to launch, build and brand America’s most successful broadcast network targeting young adult audiences through hit programs like Dawson's Creek, Buffy the Vampire Slayer, Felicity, Smallville, Gilmore Girls, The Surreal Life and One Tree Hill, amongst numerous others. He became sole President of Programming in 2001 and, two years later, became the youngest CEO in broadcast television history, including oversight of ‘Kids’ WB,’ the #1 Saturday-morning, children‘s network with boys 6-11 and tweens, fueled by hits like Pokémon, What’s New Scooby-Doo?, and The Batman. Earlier, Levin spent five years as a member of the creative team that revitalized the Disney brand in network television having developed shows including Home Improvement, Ellen, and Boy Meets World. A frequent keynote speaker, moderator, panelist and presenter, Levin is also a published author and adjunct professor. A member of the Directors Guild of America, he made his directorial debut in 2004 on an episode of “Everwood.” He is also an Emmy award winning producer. Levin has lent his strategic acumen to a variety of boards, including non-profit organizations, industry associations, academic institutions, political advocacy groups and early stage media companies, including NATPE (the National Association of Television Program Executives), for which he is a past Chairman, HRTS (the Hollywood Radio & Television Society), for which he is a past President, the University of Texas at Austin’s Moody College of Communication, the Austin Television Festival and the Austin Film Society.